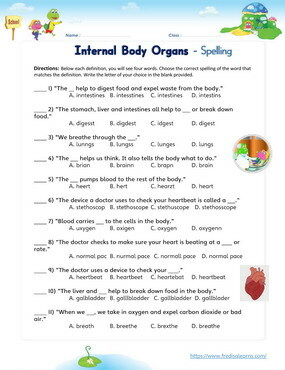 This English lesson for children teaches vocabulary about internal body organs and their functions. 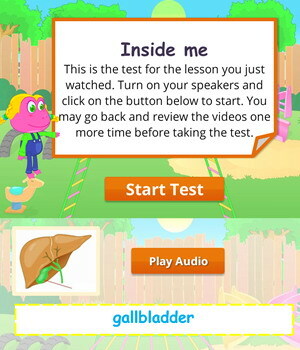 This ESL lesson also teaches children basic actions by a doctor during a health check. The lesson also focuses on the use of the third person singular and plural to talk about the functions of internal body parts. The worksheets below are useful for offline and classroom activities. 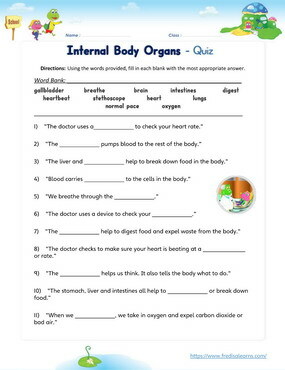 These printable exercises directly correlate with the above lesson 'Inside Me'. Every worksheet comes with an answer sheet on the second page for educators. Mom has just brought Lisa to the hospital for a health check. During the visit, Lisa asks the doctor several questions about internal body parts. 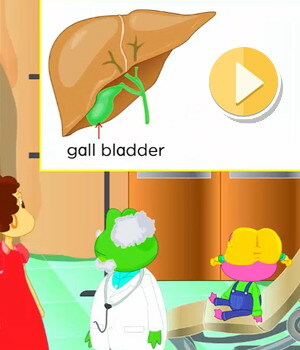 The poster of a liver and gallbladder in the doctor’s office catches her attention and leads to yet another question. The heart pumps blood to the rest of the body. We think with the brain. We breathe through the lungs. The blood carries oxygen to the rest of the body. The intestines help to digest food in the body. The intestines also help to expel waste from the body. The liver & gallbladder help to break down food. A doctor checks your heartbeat with a stethoscope. A doctor makes sure the heart is beating at a normal pace. A doctor uses a stethoscope to check your heartbeat.